This photograph shows all that remains of the grand mansion of Hornby Hall. This was the L-shaped servants' wing described by Enid. On the right of the picture we can see the buildings that were originally the coach house and stables. This dwelling is now Hornby Hall Cottage. In the second of two parts, Wray historian David Kenyon looks at the history of Hornby Hall. This week he tells the story from the perspective of two families with close connections to the property. 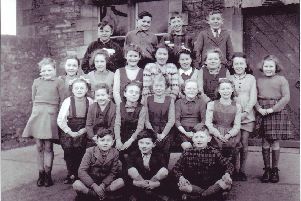 Enid’s story: I was nine years old when Hornby Hall burnt down. Hornby Hall from the back, around 1888. The hall had wonderful views of meadows, river and the hills beyond. On the left of the hall is the L-shaped servants' wing, occupied in 1946 by the Skeats and Norris families. The Norris family and our family were living in the servant quarters at the hall. This was an L-shaped, two storey building, attached to the side of the hall, with an inside door for servants to carry food through and have access to their work when the hall was a family home. I remember that there was a magnificent staircase in the entrance hall. The hall was used by Lunesdale District Council for their offices. It was around 2am on that January morning. Clothes were grabbed and we were rushed down to our living room, where we dressed very frightened and confused. Sally Porter was there, also trying to get dressed. Sally was the caretaker of the offices and lived in a flat on the top floor of the hall. Only a short time earlier she had managed to get her elderly mother, who lived with her, into a care home. What a blessing that was for the old lady. Sally had wakened and smelt smoke. She got out quickly. She then banged the dustbin lids under the Norris’ windows and wakened them. What a heroine she was. When we were dressed my mother took my sister Annie and me to Bridge End Farm, the home of Mrs Jackson who was Mrs Norris’ sister. As we walked past the church, castle gates and up to the bridge, the road was crisscrossed with hose pipes as they had to pump water out of the river and had a pump on the top of the bridge. There were other fire engines arriving all the time. By now flames were coming out of the top floor windows. The fire had started in the office on the ground floor to the left of the entrance and for some reason it spread diagonally and upwards to the top right side, so it burnt out above out homes as they were only two storey. It was later found to be an electrical fault. However, parents and adult helpers did not know that that was to be the outcome and so spent all night carrying furniture and possession into the Hornby Fire Station which was next door. The two eldest Norris girls were sent to waken appropriate people, councillors, etc. We younger ones were tucked up in a big bed by the live-in maid at the farm and joined by Dorothy, so it was quite exciting. Of course we were soon out of bed and watching the flames and other activities from our bedroom window at the farm. I suppose we did sleep eventually. We went to school the next day after dinner, then after school we went home. The adults there were carrying all their furniture and stuff back in. The place stank of smoke and charred wood. This was quite worrying. I remember my mother reassuring us as we went to bed that the firemen were staying all night to put out any flames that flared up. I think they had to do this for several days and nights. The hall was left an empty shell and although we were warned it was dangerous, it was a tempting place to play for quite sometime. The hall was eventually taken down and the land developed as you see it today. Another family that lived in the servants’ wing of Hornby Hall was the Norris family – Latham and Hilda Norris and their six children. Latham ran a market garden in part of Hornby Hall grounds. He was also a part-time fireman and was the station office at Hornby Fire Station, a short distance from the hall. When Sally Porter, Hornby Hall’s caretaker, woke the Norris family, the two eldest girls were dispatched to rouse the other members of the fire brigade who were soon in action. Altogether there was at least six fire engines fighting the blaze. However, on realising that they would be unable to save the hall they concentrated their efforts on saving the servants’ wing and in this they were successful. Hilda Norris and her six children spent the night at the home of Wilf Newhouse, the local butcher, who lived across the road from Hornby Hall.